Just a quick update about how we’re doing since my previous post http://apartmentprepper.com/hunkering-down-a…hurricane-harvey/ ?. Hurricane Harvey is now a tropical storm but it is still hitting Houston quite hard. I am sure you are all getting up to the minute news from various channels, but I just wanted to give you my perspective, as someone who is in the midst of it. Though we have had some street flooding, we are fortunate our building is not flooded and do not need to evacuate the area. It is still raining constantly, with high winds that occasionally push water from the patio into our unit. The grocery store nearby has not had any truck deliveries in the last couple of days – we know because we always here and see the trucks as they arrive and unload their goods. 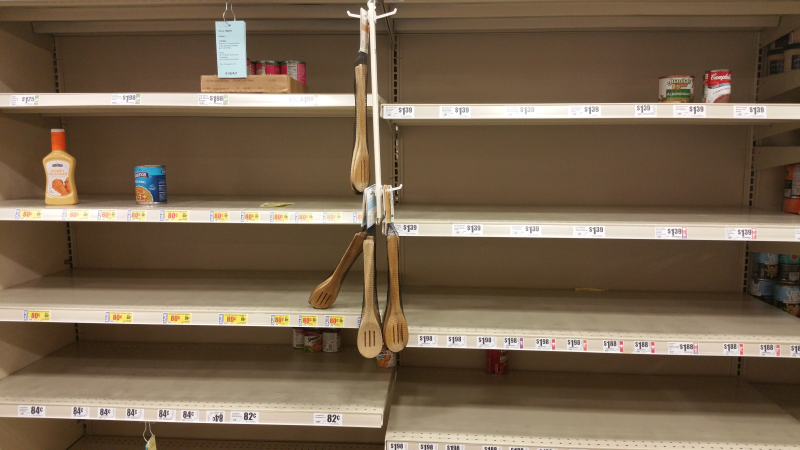 Because there are no deliveries, many store shelves are empty. While they had stock, items in high demand such as bread was being limited to two per customer. This is the same thing that happened in the aftermath of Hurricane Ike, but that storm swiftly left the area, unlike Harvey that is still hanging around after an entire weekend. We can see people who are desperate to get in the store. 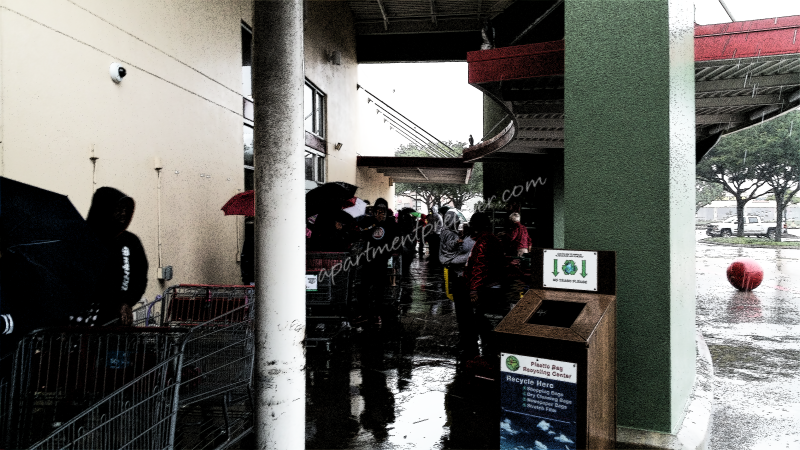 The ones that do get in are filling up their carts and buying items in a panic. 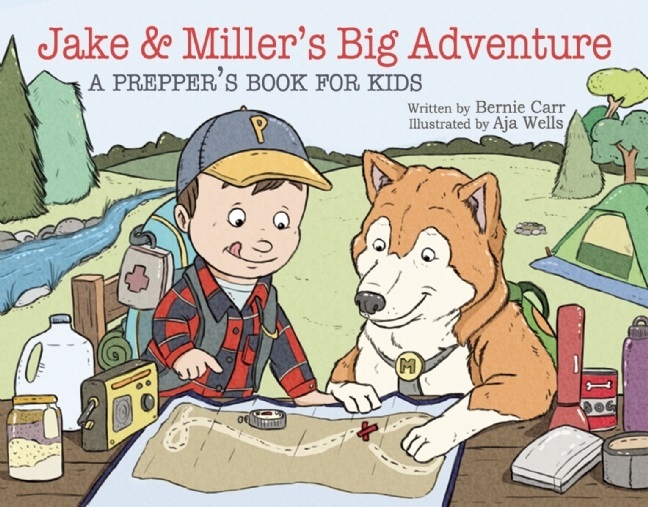 This will decimate the shelves even more, leaving less for people who come later. Many businesses are closed, so workers are unable to come in. Though they may not be flooded, I heard many restaurants and stores have water damage from the roof. This will no doubt make a difference in employees’ paychecks if they are unable to put in the hours. This would a situation where an emergency fund will be necessary to supplement the deficit. What would make us evacuate the area? Things get worse and there is a mandatory evacuation order. Management closes the building for repairs. I pray the storm dissipates soon. Thanks for all the kind comments and prayers! I appreciate all of you. 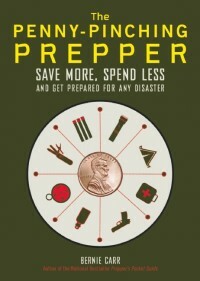 Support Apartment Prepper at no cost by using our Amazon link Thank you! “Glad your safe”. An emergency fund is imperative and individuals can collect unemployment disaster assistance from Texas if their business is closed. Thanks Real Deal! I appreciate the comment. What are your lessons learned from this experience? What do you wish you had? What worked well? What hasn’t worked? Hey Just Wondering – Interesting you should ask! Still learning from this, as it is still ongoing and I am not sure what is going to happen. I am working on that article and will post when we get past this. Thanks for the comment! I’m following your blog from Anchorage, Alaska. I am very glad you’re safe. Can you give us a general area of Houston that you are located, so I can look it up on Google Earth? Store location, general apartment location? Apartment doesn’t have to be specific. Hi Anthony, Thanks for the kind comment. I appreciate it. Saying prayers for you all! Thanks Melissa! I appreciate the prayers.